by Dave from The Longest Way Home ~ January 15th, 2014. Updated on November 4th, 2016. Published in: Travel blog » Thailand. 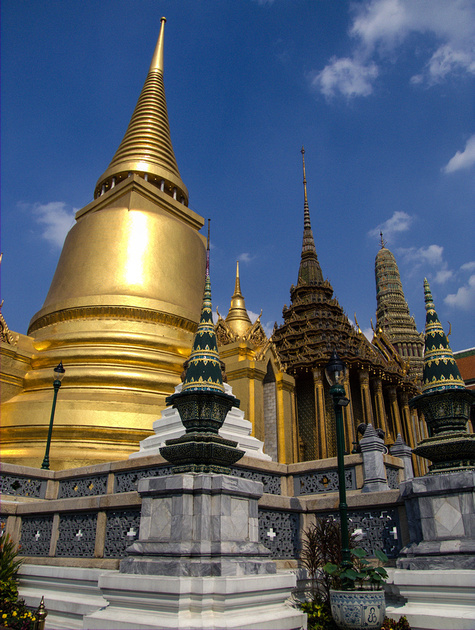 Wat Phra Kaew is regarded as one of the most sacred Buddhist temples in Thailand. 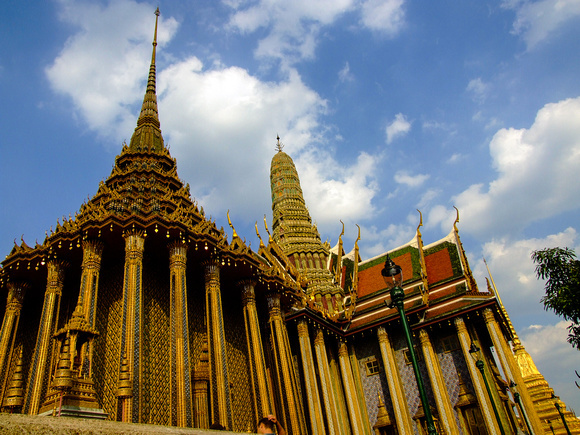 It’s located in the same compound area as the Grand Palace in Bangkok city. 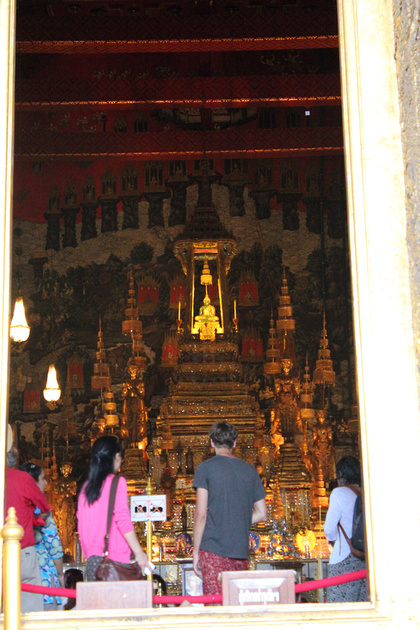 The temple houses the legendary Emerald Buddha statue. No person other than Thailand’s King is allowed to touch the statue. Thailand’s King changes a cloak around the Emerald Buddha three times a year to match the summer, winter and rainy seasons. 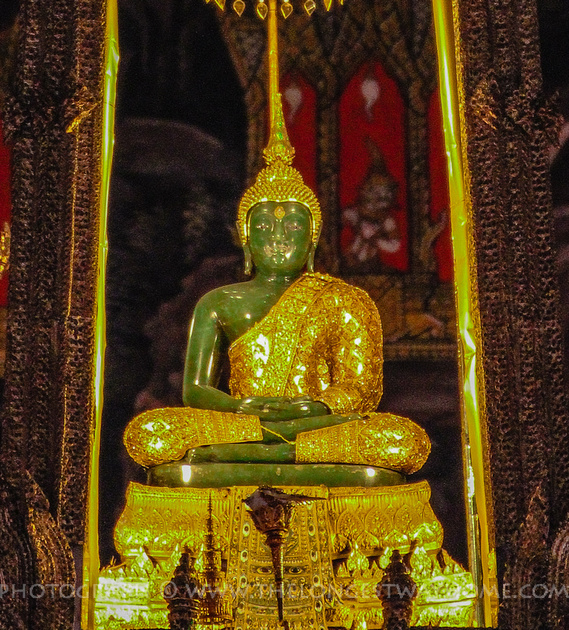 The Emerald Buddha is about 26 inches in height and carved from a single jade stone. The word “Emerald” in Thai means “deep green color” and is not related to a specific stone. 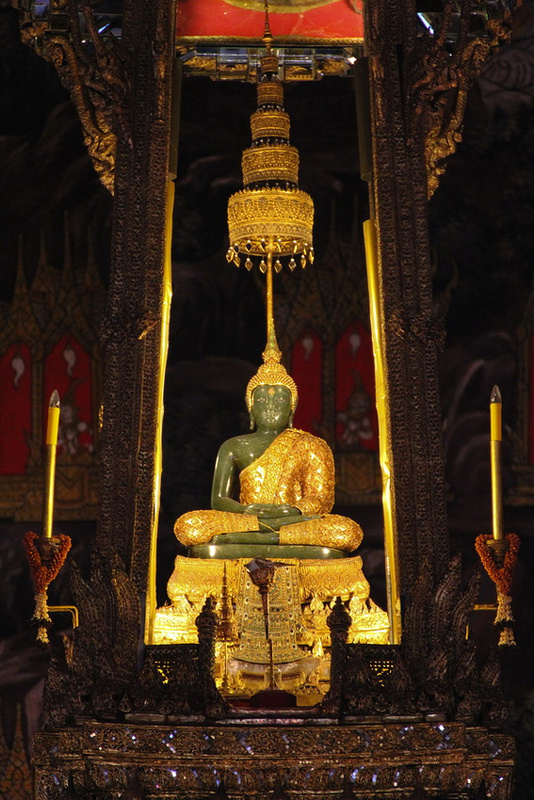 The Emerald Buddha is depicted in a meditating posture in style with the Lanna of northern Thailand. It’s forbidden to take photographs of the Statue from within the temple. Your best bet is to have a long zoom lens and an even longer arm to bat away the mob of tourists blocking your view from the outside. The Emerald Buddha statue’s history dates back to first mentions coming from India. Physically it dates back to the 15th century where it is mentioned as residing in Cambodia. In the 16th century, it’s location was in Laos while finally in the 18th century it appeared in Northern Thailand. 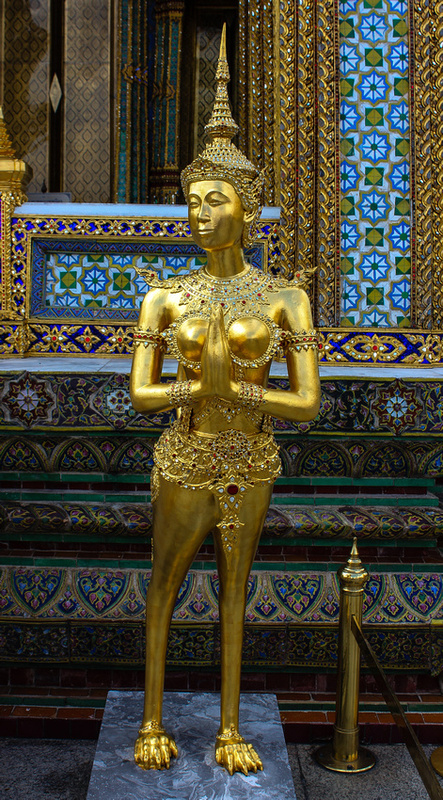 Among the many other statues around the Emerald Buddha includes several Kinnara. A half-bird, half-woman creature that is renowned for dance, song and poetry. Visiting the Emerald Buddha is probably easiest by taking a water taxi. If you are coming from a Skytrain simply head to Taksin pier. From outside the skytrain station take a water taxi to the “Grand Palace” located at Pier 8 & 9. Once at the Grand Palace you can enter the main gates or to visit Wat Phra Kaew where the statue is located simple pass the main entrance to the Grand Place and continue to the end of the palace wall and turn the corner. There’s another entrance along this wall. Do read about scams in Bangkok to avoid the touts outside. Note: No short pants, short skirts, sleeveless shirts or open shoes are allowed. Sarongs and cloaks are made available for rent at the entrance. Save time and dress appropriately to avoid the queues! 2016 update: Both the Emerald Buddha and Royal Palace remain open following the death of King Bhumibol. However, there can be large queues to the royal urn which is currently off limits to non-residents. On some occasions you’ll find that the entrance to Wat Phra Kaew does not have a ticket price. So if you only want to visit the Emerald Buddha statue try entering into the temple directly rather than through the Grand Palace entrance. It’s been so long! Are you back in Thailand or is this an old post? I think the date says January so maybe I missed this? I remember seeing this years ago but the crowds were overwhelming. Nice photo! It looks like one of those artifacts they write adventure movies from. It probably had some adventures en route too! One respects the Buddha and the journeys he took. Looks like this statue did the same. Interesting read about it’s history. Nice way of putting it into perspective. I really am enjoy what you write about from other countries. It gives us a lot to look at and read that really means a lot. Thanks. Nice read Dave. Like someone mentioned it’s a little like reading a famous story about a missing statue the way that one has been moved around. One question, do they still move it around or is this now it’s permanent home? Thanks Stuart. Yes, the palace is it’s permanent home for now. I don’t thing anyone else has a claim to it. Great post! I was just a the Emerald Buddha a few months ago, and I really wanted to take photos, but I got yelled at when I took my camera out.. Oh well!